A former member of Sheriff Ross Mirkarimi’s transition team reiterated a call for the sheriff — whose description of the allegations that he bruised his wife Eliana Lopez as a “private matter… a family matter” were soundly criticized — to step down while an investigation into possible domestic violence is conducted. 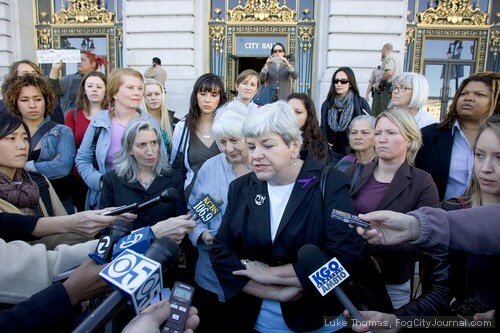 Upton took a step back from words issued earlier in the day, calling for Mirkarimi to resign. Instead, she said, the sheriff should “step aside” and allow the criminal investigation to run its course before conducting business as county sheriff. Mirkarimi assumed office on Sunday, days after allegations surfaced that Lopez told a neighbor that she’d suffered bruises on her right arm after Mirkarimi grabbed her on New Year’s Eve. Police investigated the neighbor and confiscated a cell phone and a video camera for images and text messages from Lopez allegedly describing the abuse, according to documents obtained by The Appeal. According to Mirkarimi’s attorney, it has been rumored that if the District Attorney opts to file charges against the Sheriff in the case, that news will be delivered Friday. San Francisco sheriff’s deputies momentarily delayed Upton’s address to media when they asked her to move the conference off of the City Hall steps for lack of a permit. The afternoon took a turn for the incredible when several reporters mentioned seeing Lopez in the crowd of women behind Upton, demure behind dark sunglasses. 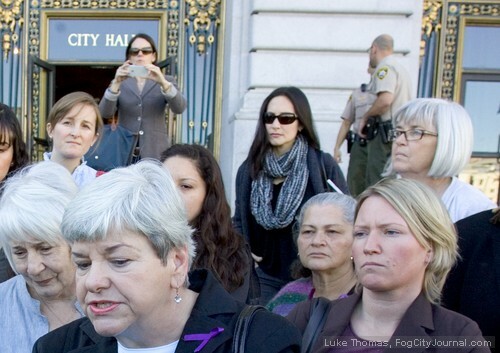 SF Weekly’s Joe Eskenazi was the first to report seeing Lopez on the City Hall steps, reporting that he chased her down for an interview; “No comment,” Lopez — or the woman alleged to be Lopez — replied. Photographer and Fog City Journal Editor Luke Thomas supplied The Appeal with photos of the woman believed to be Lopez, which you can see in this article. The Appeal could not immediately corroborate this particularly fantastic nugget on Thursday afternoon. Telephone messages left at the office of Robert Waggener, Mirkarimi’s attorney, and Jim Stearns, the sheriff’s campaign consultant and to-date de-facto spokesman, were not immediately returned — but one political operative shared our initial disbelief. “That would be… interesting,” the politico said. 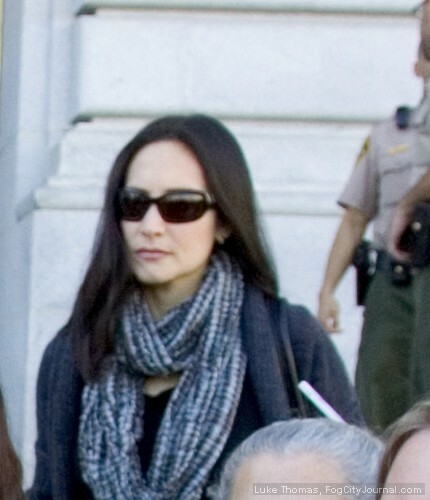 A spokeswoman for Mirkarimi said that the sheriff, stuck in meetings at City Hall on Thursday, would not be commenting.